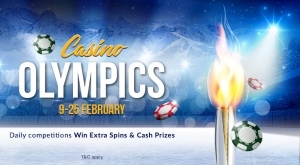 You might be one of those who are glued to the TV in order to follow all of the superb winter sports action that is happening in Pyeongchang at the moment, but ShadowBet has a new fantastic casino promotion that needs your attention for a moment. Complete the daily tasks in the game of the day and you could win valuable bonus spins and huge cash prizes! If you are among the top winners you will get a share of the daily prize pool and up to 150 extra spins! You will also collect Olympic points over the course of the promotion and at the end of the competition the 25 players with the most points get a piece of the juice prize pool. Only one winner can get the top prize of £500 in bonus cash! On the promotion page at ShadowBet, you can see the full schedule of the daily competitions. Extra spins and bonus money won from this competition have a wagering requirement of x1. Read full terms and conditions at ShadowBet. There are other ways to get shiny bonus spins during the promotion as ShadowBet has a new offer available every day during the Casino Olympics. When you make a deposit of at least £10, you will get 20 extra spins on the game of the day - every single day! Note that the bonus winnings have a wagering requirement of x35 and ShadowBet's bonus terms and conditions apply. Log into your account now to claim your first bonus spins and test your skills in the world’s greatest Casino Olympics!